A sensor that utilizes the piezoelectric effect, to measure changes in acceleration, strain, pressure, and force by converting them into electrical charge is called as a piezoelectric sensor. 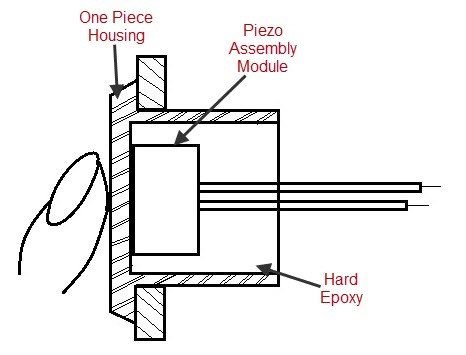 Piezo is a Greek word which means ‘press’ or ‘squeeze’. Piezoelectric effect causes the occurrence of electric dipole moments in solids due to the pressure applied to certain solid materials such as piezoelectric crystals, ceramics, bone, DNA, and some proteins that generates electric charge. This generated piezoelectricity is proportional to the pressure applied to the solid piezoelectric crystal materials. In this article, we will discuss about one of the most frequently used piezoelectric sensor applications, that is, piezo sensor switch. An electrical switch that works based on the principle of piezoelectric effect is called as a piezo sensor switch. The Piezoelectric sensor switch can be turned on, by activating the output of semiconductor device such as a field effect transistor. This can be done using the charge generated by the pressure applied to the piezoelectric sensor element. If the field effect transistor is on, then current will flow through the FET acting as a metal contact-based switch. If the voltage pulse in the gate resistor is dissipated, then the FET turns off or turns into its regular high impedance state. We know that piezoelectric sensors generate an electric charge proportional to the pressure applied to certain materials. 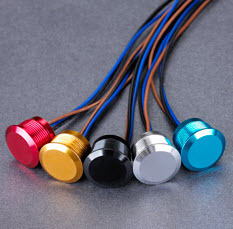 But, in case of piezoelectric sensor switches, typically the disc-shaped piezo element tend to bend very slightly like a drumhead due to the force or compressive pressure applied to certain materials. The voltage generated due to a single on pulse, produced by the pressure applied to the piezo switch can be varied by varying the amount of pressure. If the pressure applied to the piezoelectric sensor switch is increased, then higher voltages can be generated, which take a long time for dissipation. We can also increase the pulse width by lengthening the time constant of the gate circuit using a capacitor that stores charge. If we use a flip-flop, then by toggling flip-flop, we can change the output state from steady off to steady on. Compared to conventional mechanical switches the piezoelectric sensor switches don’t have moving parts, but the front plate and piezo element get little deformed typically by a few micrometers. As there are no moving parts, the lifetime of the piezoelectric sensor switch is more and these switches can be used for tens of millions of operations. These piezoelectric sensor switches are weatherproof as they are completely sealed from the environment. As, stainless steel is used for construction of piezo sensor switches, they can withstand the damage and are resistant to heavy use. The piezoelectric sensor switch is an alternative for impact or vibration detection and momentary switch applications. Strain is induced on the laminated piezo film sensor element due to the direct contact of the force applied to the stainless steel cantilever beam. Piezoelectric sensor element will generate an output that activates a normally opened, built-in circuit. 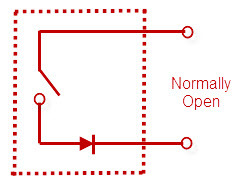 If a circuit is activated, then it resembles a contact switch closure and due to corrosion, bouncing and pitting the contact points exhibits. Thus, a single digital pulse is provided for triggering digital circuits. Because of the features like improved reliability and elasticity of the piezoelectric sensor element, it is suitable for applications demanding reliability and consistency in performance for tens of millions of cycles of operations. Pressure is applied to the surface of the piezoelectric sensor switch that deflects about 2microns and this applied pressure is converted into an electrical signal by the piezoelectric crystal. This electrical signal generated by the piezoelectric sensor material is given to the electronics embedded in the piezoelectric sensor switch housing for amplification. Piezo knock sensor generates voltage proportional to the amount of stress, such as vibration or knock applied to piezoelectric crystal. It is used to detect knocks and hence it is also called as a piezo knock sensor. Piezo knock sensor Switch can be implemented using Arduino board based real time project. 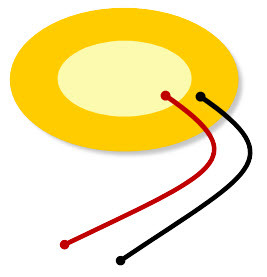 It is a polarized electronic component, which consists of two leads: one positive and the other negative lead that are connected with a 1M ohm resistor between them. The Positive lead is represented by red color lead and is connected to A0 analog pin on the Arduino board. The Negative lead is represented by black color lead and it is connected to GND ground terminal on the Arduino board. The Pizeoelectric sensor knock circuit is designed to turn on or turn off the load connected to the circuit by applying knocks to activate the piezo knock switch. Consider Light Emitting Diode(LED), such that the LED anode is connected to the digital pin 13 and its cathode is connected to the ground terminal of the Arduino. If a knock or vibration is detected by the circuit, then the circuit will turn on LED (load) for a predefined time based on the program. From the above program, we can understand that the initialization process is done with the first block of code. 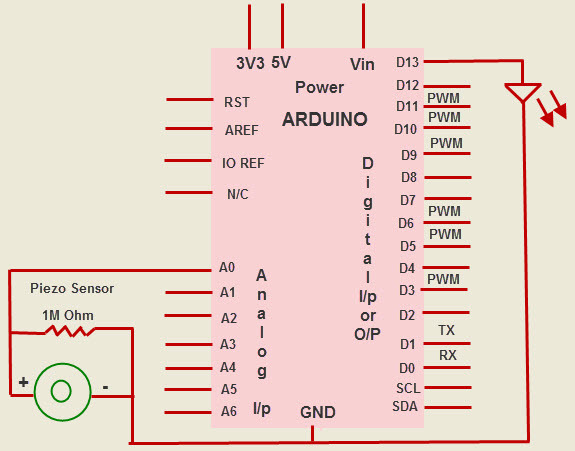 The sensor pin is initialized to pin 0 as the positive lead of the knock sensor is connected to the Arduino board analog pin A0, and the LEDs are initialized to pin 13. As there are always some vibrations in the environment, a threshold of 100 is created such that the senor will not be triggered for small vibrations less than the threshold value. Thus, we can decrease the threshold value for triggering knock sensor for low-sounding knocks and we can increase the threshold value for triggering knock sensor for louder knocks. Then, in the program’s second block, the LED is connected to an output pin. Finally, in the program’s third block, an integer called val is created for reading value obtained from piezoelectric sensor or knock sensor. Thus, if the value obtained from the knock sensor is greater than the threshold value, then the LED will be turned on for 10 seconds and if the value obtained from the knock sensor is less than the threshold value, then LED remains turn off. Here the load is represented by LED and thus, we can use piezoelectric sensor switch or piezo knock sensor switch for turning on and off the load based on the piezoelectric effect. Do you know any applications in which piezoelectric sensor switches are used? If yes, then share your technical knowledge regarding this article and feel free to contact us for any technical assistance regarding the piezoelectric sensor switch based electronics projects by posting your comments in the comment section below. I found this page from a Google search for piezo switches. You refer to them as piezoelectric sensor switch. This page does not indicate how to buy them. A search of your site for piezoelectric sensor switch yield no resukts, not even this page. Can you help me to purchase a a few for experimentation? Sorry to inform you that we dont sell any components, we provide student level electrical and electronic engineering projects.